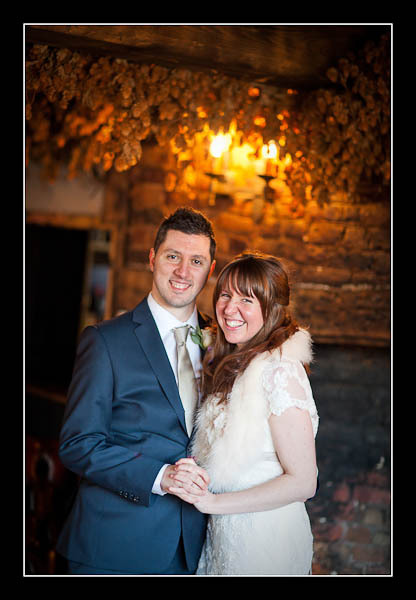 I had the pleasure of photographing Laura and Gary's wedding on Saturday at St Laurence Church in St Lawrence, Ramsgate (I asked the the vicar about the u-w discrepancy in spelling but he said that nobody quite knows how it came about) and then The Dog Inn in Wingham. It was rather chilly, icy underfoot and the light was very harsh but we managed to overcome the hurdles imposed by mother nature and had a successful wedding shoot! Please view the images from Laura and Gary's wedding at St Laurence Church in Thanet or this alternative non-Flash based gallery. Very interested to see you using the 85mm at F/1.2 regulalry. I have tried that lens (micro-adjusted) a few times with a 5D2 and the lens is at it's optical worst in terms of mushy details at that aperture and really bad CA. Comes to life around F/1.8 and above in my experience. What's your view on this? I suppose clients viewing on screen or printing A4s wouldn't notice anyway. I'm a huge fan of this lens at f/1.2 due to the ultra shallow DOF. Clients love the effect this has on images too - much the same way as everyone seems to love B&W. Both are unnatural, in the sense that they represent the world in a way that our eyes and brains are unable to, but also deeply appealing. Yes, the images are softer (but this can be appealing to many brides) but the area in focus still sharpens up quite nicely. Chromatic aberration is something I keep an eye on (particularly with dark against light areas - branches against overcast skys for example). Focus can also be a challenge. Very occasionally an area of high contrast close to the focus point will lure the AF system or it will just struggle to focus on the point I'm interested in. To mitigate against all this I don't shoot at just f/1.2. When I can I'll quicky take 4 repeat shots, stopping down to f/2. I'll then critically assess in post-production. If the image at f/1.2 is good though it's often the one I'll put on the blog.